Our wooden beam seating is with function and style at its heart, the exposed wood gives a modern feel whilst being complimented by thee metal frame work and modern design, ideal for use in public areas such as schools, colleges and universities. all come with a minimum 12 month manufactures warranty and free delivery to mainland UK. The distinctive Bingo range of wooden beam seating is a firm favourite, thanks to is robust and striking design. The 5 layer plywood seat shells come in a choice of seven wood finishes. The seats are mounted on a heavy duty metal frame in a choice of powder coated Black or Silver. 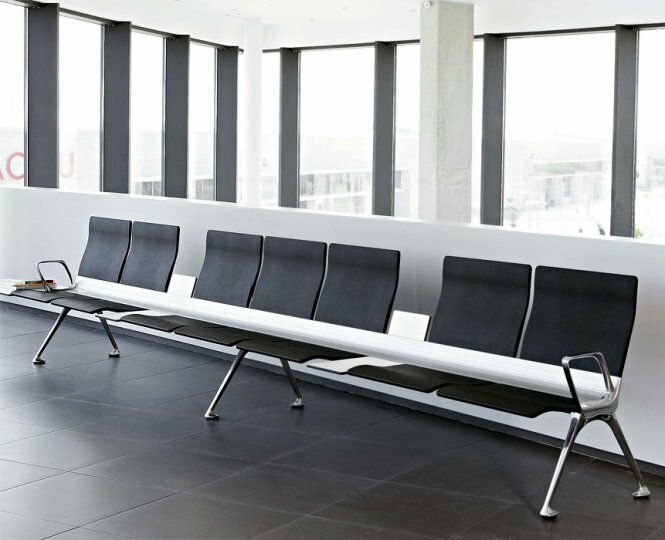 The solid construction makes this range of beam seating suitable for high traffic environments. Large arms with wooden arm pads are fixed to the end of each beam to give additional support to the user. Bingo beam seating is available in 2. 3 4 and 5 seater variations. Another popular range of wooden beam seating is the Isis range, which can be specified with an optional table instead of a chair. The plywood shell is offered in Natural Beech, Natural Cherry or Dark Cherry. The foam filled seat pad can be specified in fabrics or vinyl colours. Isis wooden beam seating is manufactured in the UK and is covered by a five year factory guarantee.